Good time, learned a lot! Led by qualified instructors from the Mississippi State University Extension Service an the professional Arborist Association of Mississippi, this short course is designed to provide students with a basic knowledge of arboriculture. As a result of attending this course, students will be well-prepared to take the Certified Arborist Exam. The short course will employ a webinar format with class interaction occurring through email and chatroom. Many students will be professional tree workers; however, Master Gardeners, Master Urban Foresters, Master Naturalists, and anyone interested in trees are welcome to enroll. A discussion board has been created for urban forest inventory volunteers. This discussion board provides a forum to share experiences, discuss insights, and provide feedback about the urban forest inventory projects taking place in their communities. Follow the link to participate. By 2020, the Mississippi-Alabama Gulf Coast population is projected to increase by 75% to 1.3 million residents. This rate of urbanization impacts urban forest ecosystems which in turn influence local resilience regarding, e.g., thermal comfort, energy use, air quality, carbon storage, wildlife habitat, health benefits, property values, and commercial benefits. Urban forests also act as natural storm buffers by reducing wind speeds, improving water quality, and intercepting the flow of precipitation reaching the ground. 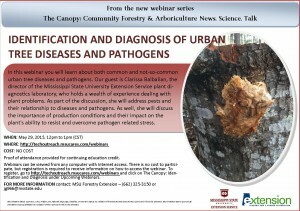 This research and outreach project addresses four related issues: (1) there is a need for urban ecosystem management along the Mississippi-Alabama Gulf Coast; (2) urban ecosystem management is critical to community resiliency; (3) tree canopy data is a baseline for informed ecosystem management; and (4) sustainable urban ecosystem management requires resident engagement. To this end, we identified resident needs and concerns about urban trees and storm mitigation from key informant interviews and a mail survey across the study area. 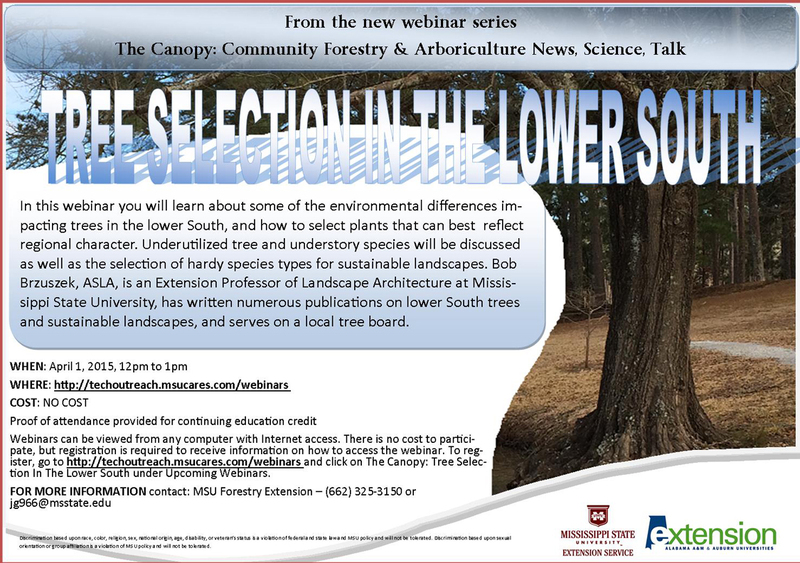 Using the survey information, we then implemented four bottom-up, volunteer-based urban tree inventories. Inventory projects included several trainings and public workshops for which we gathered evaluation data. Research results indicate important concerns regarding tree hazards, homeowners insurance, and sustainable urban tree management. Despite these concerns, pre- and post-evaluations demonstrate a significant increase in knowledge and positive attitudes about trees, urban forest management, and level of self-efficacy regarding participants’ ability to contribute to community forest well-being. This paper examines the extent to which Gulf Coast communities value waterfront green space preservation versus developing waterfront open space. Urban green space near waterfront areas includes socially valued landscapes such as scenic sites, wilderness areas, historic and cultural resources, recreation areas, rivers, lakes, estuaries, and salt marshes. Green space provides a wide variety of goods and services including aesthetics, wildlife habitat, recreational opportunities, urban heat island reduction, air quality improvements, stormwater runoff amelioration, energy use reductions, exercise opportunities, a place to relax, and increased real estate values. Many wetlands along the Gulf Coast offer prime examples of how continued degradation of green space increases socioeconomic and biophysical vulnerabilities at local and regional scales. Nevertheless, green space policy-making is complicated by local governments’ dependence on property taxes for operating revenue as well as increasingly limited municipal budgets which exacerbate opportunity costs. Despite these challenges, it is critical to consider the benefits of green space when evaluating waterfront uses, particularly in places characterized by increasingly land consumptive development patterns such as those along the Gulf Coast. The overall goal of this research is to assist coastal communities in making informed decisions about waterfront planning and management towards increased social and ecological resilience. We used a mixed methods, multi-disciplinary approach to generate an in-depth understanding of how communities value and use waterfront spaces. Facilitated group discussions are conducted to generate insights about emerging phenomena and obtain contextual information (including environmental and social inequities). In addition, we incorporate these findings into a general population mail survey to determine tradeoffs among alternative waterfront uses and development scenarios. Finally, a revealed preference model was employed using market transaction data. Findings expand on notions about community attitudes and values towards public goods and the local actions needed to efficiently manage those goods to improve social-ecological adaptations. Results point to the need for public intervention to address market failures, including public acquisition of land, regulatory approaches, and incentive-based approaches. Implications for planning and policy are considered in addition to recommendations for outreach education. 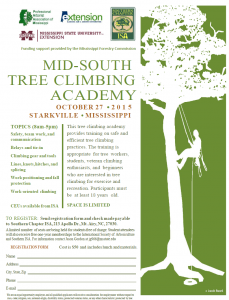 This project encompasses three related issues: (1) a critical need for urban ecosystem management in Mississippi; (2) tree canopy data is a baseline for informed ecosystem management; and (3) sustainable urban ecosystem management requires resident engagement. Our multidisciplinary project team will work with arboriculture professionals and communities to teach residents and Extension agents to conduct urban forest canopy inventories using I-Tree Eco software. Residents will improve their knowledge and skills regarding ecosystem management and strengthen community social activeness. Data will be used to further local efforts in urban planning and grant writing. This project pilots a new educational program for the MSU Extension Service, reaches urban clientele, and expands program offerings to include civic ecology/community forestry.